With 4.91 lakhs students applied online, the Kerala Plus One allotment process is nearing its next stage of admission. Other than the students who have passed the SSLC exam, more than 50,000 applications were received till date which include those from CBSE, SAY exam winners and SSLC passed students from other states. According to the available information, higher secondary seats will be made available to accommodate 4.42 lakh students. From 9th June onwards the state education department has initiated to supply forms to those students who have failed to submit application online. Those who couldn't follow the online process much use this facility while the last date of submitting application is restricted to 12th June 2014. As per the procedure of the Single Window System (SWS), the trial allotment would be made on the basis of the options registered and the rank of the candidate. Even though, the trial allotment does guarantee the candidate a seat in a school or a course, it would give the students an idea about their status of admission. The list can be checked at www.hscap.kerala.gov.in by submitting the application number and date of birth. To view the trial allotment, students should navigate to candidate login section and login by entering your application number and password there. After the time earmarked for revising options, first allotment list will be published in the official website of the HSCAP. The first allotment results will be published in a week time after the trial allotment. The students can revise the options after the second allotment also. The applications for such corrections should be submitted to the school authorities. Instructions for this will be made available in the website. After the first allotment list gets published in the website, students who are listed in the allotment should have to remit the fee as per the procedure. 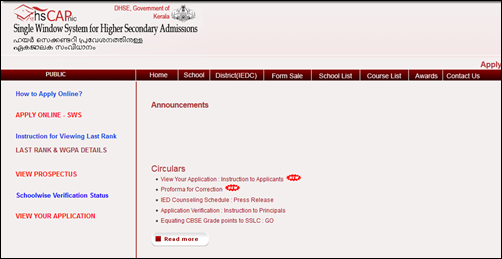 As the date of admission in the concerned school will be declared through a notification, candidates must keep in touch with the HSCP website http://www.hscap.kerala.gov.in.